Garlic, a member of the Amaryllidaceae family, thrives in full sunlight and is a good neighbor to most plants, except legumes and alfalfa, and is thought to repel rabbits, deer, moles and insects. Its flowers are hemaphrodite, having both female and male organs. It is a perennial that is not frost tender and is cultivated worldwide. The garlic plant has a long folk history. Its use has been recorded in Vedic times, across cultures from ancient China to Egypt. It was believed to ward off diseases and infections and to confer strength, so the ancient Egyptians and Romans fed it to fortify the laborers who built their pyramids and other monuments. 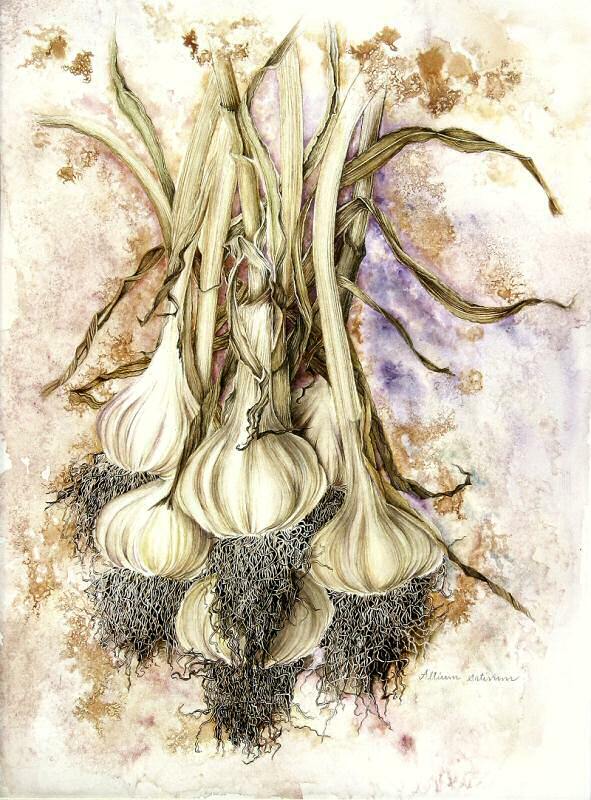 Garlic has had wide recognition for its fungicidal, germicidal, antiseptic and tonic uses wherever it is grown. Recent research has not only confirmed such ancient folk knowledge about its many health benefits, but can indicate how garlic aids in healing. The enzyme allicin which is the source of both odor as well as of therapeutic value, is released only when garlic cloves are crushed or chopped. The flowers, leaves, root and seed of the garlic are all edible. The seeds are sprouted and used in salads; the leaves are milder and eaten raw or cooked; the flowering stems are used as a flavoring. But it is the edible bulb which has been in longest use for its nutritious, healthful and medicinal properties. Quite often in the past while the upper and priestly classes found its odor repugnant, it was mainly the poor who ate it. But today no kitchen that boasts fine cooking would be without its braid of fresh garlic. The juice from the bulb is an effective insect repellent and can also ease the pain from insect stings. Despite its efficacy, the powerful smell of garlic would not make it a popular topical application. But let’s not forget that garlic was also thought to repel evil spirits and vampires! © 2007 – 2014, milly acharya. All rights reserved.